At the Church on the Heath , Fleet ,Hampshire. 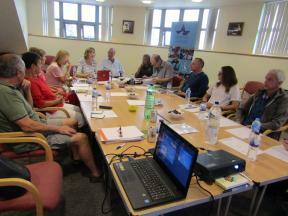 The AGM was attended by all the Trustees and Committee Members. 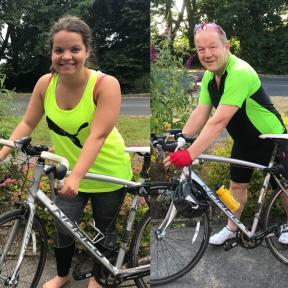 J ohn and Amali are cycling in Ireland from Rosslare in the SE to Derry in the North from 21-28 July 2018 . 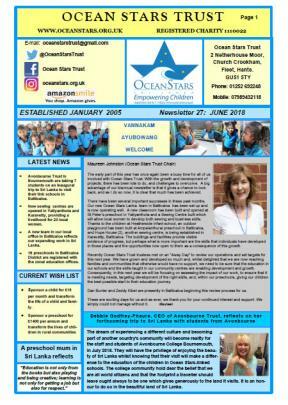 They are raising money for Ocean Stars and would welcome donations for the work of Ocean Stars in Sri Lanka. 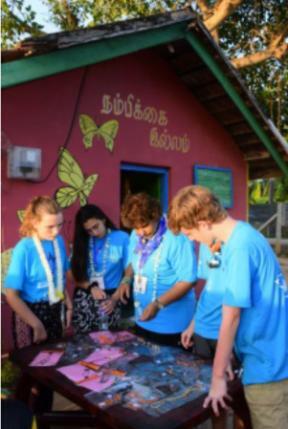 Ella is one of the 21 students from Calthorpe School in Fleet going to Sri Lanka in October 2018 with Ocean Stars Trust to visit their link schools. Ella was fund raising at a her Theatre club show last Sunday. She was fund raising towards their group target of raising £10,000 for the work of OST. The group has so far raised an amazing £8672.00 toward their target. Well Done and Thank you Ella and CPS TEAM 2018 on your magnificent fund raising efforts. and almost every family has a story to tell of suffering, separation and heartache. 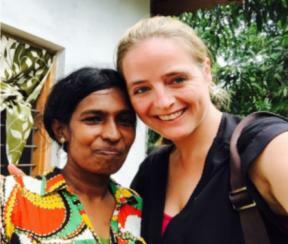 The UK Entrepreneur selected for the project in Sri Lanka was Jess Butcher, MBE, and Co-­ Founder of the company "Blipper". 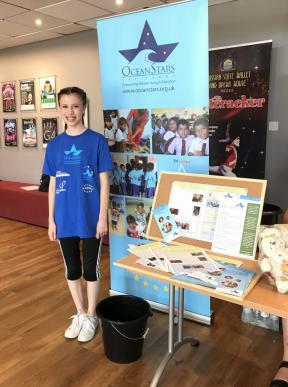 Ocean Stars has been very privileged to work with Jess since the documentary was made and Jess has committed to continue to support the village rather than view the project as a one off lifetime event. We hope you enjoy Jess's very special story, in her own words. on the 'Undercover Millionaire' series - starting from the premise that I was entitled, high-net-worth, and naïve to the struggles of developing, deprived communities. But this of course is, in the main, true - certainly relative to many communities and in my charmed, day-to-day existence. But over endless discussions with my husband, Gray - we decided that this was a unique and incredible opportunity- both to give back and share some of our good fortune, and to self-discover, shake me from my happy comfort-zone and sharpen my humility. leaving behind my husband, a 2 year old and a tiny 4 month old. bustling road-side life, plus, the odd wild elephant holding up the traffic. to happen next. The British film crew were allies of a kind, but not really... friendly and reassuring in many way, but also aloof and silent to my questions, preferring to capture my unease than assuage it. to be a small kitchen, containing just a few pans and an open fire place. with the intention of coming up with a business start-up/ community project that I could set in motion by the middle of the week and complete by the weekend... (Riiiiiight. No pressure then - anyone else remember 'Challenge Anneka'?). The work was to start right now and after a quick splash of well-water to freshen up, my interpreter lead me down the muddy road, film crew shadow in tow to meet with the owner of the village convenience kiosk. to take care of her. They were married within 6 months, had what I discovered to be a rare 'love-marriage' amidst the turmoil of war and were blessed by the birth of a son within the year. It was just one year after their son's birth that he vanished, just as many local men did - there one minute, gone the next. The truth was apparent to me, but seemingly not to her. She cried as she told me how he was just one of the 'missing' and that she had to believe he could still be alive somewhere, displaced, temporarily lost and that he may still return and I felt my own tears appear. Who was I to tell her otherwise? Above her as she spoke, was a photograph of her with her now 7 year old son with the last picture taken of his father digitally super-imposed into the image next to them. I thought of my own family and it broke my heart. She scraped a living for her son selling these stale biscuits and sacheted goods. a bad head cold and in my exhaustion, I got back up and had my first cigarette in years under the moonlit palm tree in the silent yard. The rest of that week, I ploughed through a pack a day. this village. A sadness and grief hung around the otherwise idyllic, palm-tree lined village and yet, there was an acceptance of their fate- everyone just carrying on and doing what they could for the sake of the children. Even long after the end of the war, Ampilanturai was fighting its daily battles, and frankly, it seemed to be dying. Amidst frequent musings to camera (which I became weirdly comfortable with), bicycle rides around the village with the kids, amblings across paddy fields and during the quiet nights on my torture-rack bed, my ideas started to coalesce and I realised that the only thing of value that I could potentially contribute here would be education. But... and it was a big 'but', I had only three remaining days to come up with a plan and implement it prior to flying off home and potentially out of these people's lives. It was a mere drop of time, but it offered a hint a promise. swallowed it back and focussed on doing something. Anything. The next four days were a blur of activity. Thankfully, the film crew had contacts and a project manager available, primed to support me in whichever direction my ideas turned as without this, I would have been powerless. All my years of entrepreneurialism and successful business-building were worthless without local speakers, experts and 'fixers' - and fix they did, with an efficiency and speed that any one of the start-up businesses I've been involved with would have been proud of. We scouted the village in search of an available, vacant building; we met with government officials to outline my plans, bartered in the furniture and and electrical shops in the local town and grabbed road-side pakoras where we could. quite big enough for everything I wanted so I discovered that we could add a shipping container room to the side, above ground - a perfect, secure room for computers. I bought one (one of the more bizarre purchases I've made in my life - alongside the tuk-tuck and the live cow I found myself acquiring the following day) and it was immediately dispatched by lorry from Colombo on a slow, two-day journey. 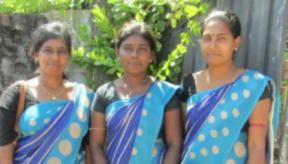 I interviewed local women for three full-time manager and caretaker roles within the centre. I obsessed disproportionately about a butterfly mural I wanted on the wall - a symbol that reminded me of my daughter's freshly painted nursery back home - and in my head, the project had become 'Hope House' (I even had a subbrand slogan: 'Giving Ampilanturai wings' - with apologies to Red Bull). The time available didn't give us scope to do everything I wanted. We would need to find and appoint IT, language and sewing teachers, arrange the delivery of more technology and office supplies and start to market the centre to the community - but I was given a critical alliance at that time to reassure me of ongoing support with the project. the nearest town, ready and willing to support me with administering the day-to-day operations. The last 24 hours were some of the most stressful of my life. Problems with red tape, workmen not following instructions, the late arrival of the shipping container –whose concrete foundations had been incorrectly set, requiring it to be temporarily hoisted into the boggy field next to the centre and much, much more. The nononsense, frustrated business-manager in me had to come out in full-force on more than a few occasions. blooming flower garlands. (I had been painstakingly pinned into my own sari by my new friends at a girly pre-party, quite reminiscent of many Friday nights past- minus the sauvignon). an impromptu, incongruous 'Gangnam' dance routine from Jaya's son. watch national cricket matches on the big screen or family films with the children. Somewhere happy, somewhere hopeful... and that night, everyone's eyes shone with the potential of what we'd built. the world (or so the strange tweets I occasionally receive seem to confirm!) - but the vain part of me doesn't actually mind too much. I'm not sure the world needs to see me that sweaty, in such high-definition, carrying that much post-baby weight, nor as oddly spoken –slow and over-enunciated (of course, for the benefit of my translator - although that isn't apparent in the edit!). Frankly, I'm not sure how well I come across in it at all– a little too 'cool' and detached maybe (no weepy, comic-relief-style scenes here- I tend to be quite a steely person, emotionally) but to even worry about any of that in the context of the mission I realise is narcissistic. the monthly cost of around 5 people's UK gym memberships. So much so that Ocean Stars, who have done such a wonderful job with their on-the-ground management - have been petitioned by numerous other villages in this regions to set up more Hope Houses. And this, of course, is the agenda for this story - which I hope you've enjoyed. beautiful children and strong, amazing mother who stepped up and held the fort that week and continue to support me in everything I do... I'm so, so lucky to have you. And last, but not least, Jaya Kumari, Jaya Teacher, Lakshmi and the many awesome, inspirational women and children of Ampilanturai. Thank you for allowing me to walk in your shoes and opening up your lives to me. Thank you so much for continuing to build so much hope and opportunity out of the small, (wet) foundations I left behind. With the growth and development of projects, there has been lots to do, and challenges to overcome. 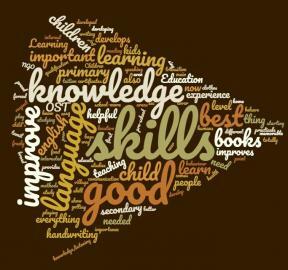 valuable experience in International Development? Calthorpe Park School Team 2018 had a student parents meeting on 14th June 2018 to continue with preparations for their trip to Sri Lanka in October 2018. The students found out that their fund raising efforts so far has raised £6652 for the work of Ocean Stars Trust. The students have been involved in bakes sales, coffee mornings, sponsored cycle rides, sponsored walks, jobs around the house, part time paid work, mufti days in their efforts to raise money to support the work of the charity in Sri Lanka. 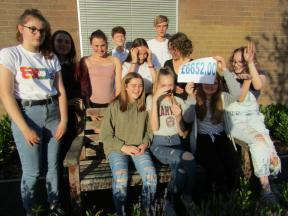 They are working towards a goal of raising £10,000 by October 2018. Well done CPS Team 2018!! Keep going! 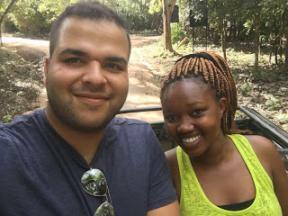 The Co-Founder of Blipper met up with Dilanee Bunter Founder and Operation Manager of Ocean Stars Trust to discuss strategic planning for Hope House. 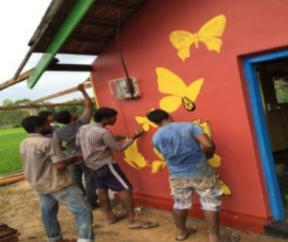 Hope House is a project in Ampalanthurai Eastern Sri Lanka that Jess helped to set up in December 2015. 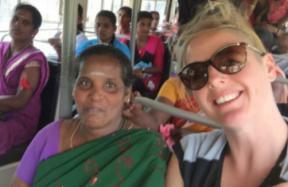 Dilanee and Jess were involved in the making of a programme for a global documentary series for National Geographic. Ocean Stars Trust was chosen by National Geographic as the charity to support in Sri Lanka whilst making the documentary. Dan and Zeddy are in Sri Lanka for 100 days doing an Impact Evaluation Project for Ocean Stars Trust UK Registered Charity 1110022. 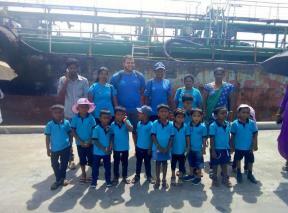 On Tuesday16 May 2018, 20 children from Chenkalady 2 Preschool, 20 parents, three teachers and three Ocean Stars Lanka staff and two Ocean Stars volunteers Dan and Zeddy went to Trincomalee for their annual preschool outing. First stop, Trincomalee Harbour. The harbour, the second largest natural harbour in the world. 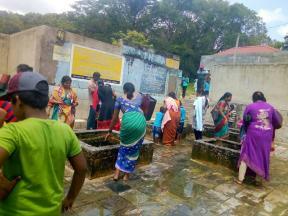 They left Chenkalady at 7.00 am. This meant a 4.30 am start for our volunteers and staff. The children would have been up from 5.30 am, and parents even earlier to prepare the picnics. 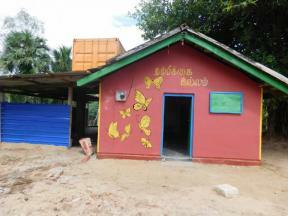 Chenkalady 2 is one of the 20 preschools in Sri Lanka supported by Ocean Stars Trust UK. Promise Auction - can you help? What can you offer as a promise? Any other hidden gifts and talents? Sign up to offer your services or goods. You do not need to be present at the auction in order to offer a promise, although you are very welcome. Once your item has been purchased the buyer will contact you to make arrangements. Sealed bids can be made before the event. along with the relaxion of a cream tea.